After breakfast we make our way to the Nkomazi Private Game Reserve, arriving in time for lunch and your afternoon/evening game drive. The Komati Tented Lodge defines an 'Out of African' styled tented accommodation with all five star amenities on offer. Guests will experience not only the quietness and solitude, but a sumptuous comfort that basks in the sense of the age-old life of Africa. Each tent has an extra large king size bed, comfort cooling/heating and en-suite shower with an outdoor bath, and private expansive teak sun decks with a plunge pool. Meandering pathways lead to the main tent where traditional fare can be enjoyed at your own leisure, while a treatment at the River Retreat will rejuvenate and relax - doing its small part to restore the delicate balance of all living things. Relax in comfort and African style among wildlife of diverse habitats along the clear streams of the Komati River. 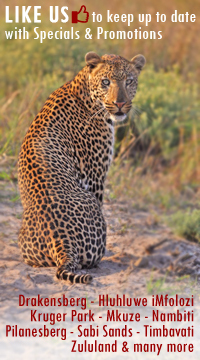 Game viewing is carried out during the morning and evening and has been refined to an art by experienced rangers. Traversing through the reserve, the wildlife is staggering in its diversity. The game drives take between 3 - 4 hours, with a coffee stop in the morning and a sundowner's stop at a vantage point overlooking one of the many breathtaking vistas at sunset. The night drives are normally conducted en route back to the lodge after an afternoon game drive, where the focus shifts towards nocturnal species that are sought out from the game drive vehicle with the use of a spotlight. Tailor made night drives can take place after dinner to provide a better opportunity to find elusive nocturnal species. It is always advisable to take a hat and warm clothing, even in summer. In winter, a warm jacket, beanie, scarf and gloves are advisable. This morning we depart the Hluhluwe uMfolozi Park after breakfast and make our way to the village of St. Lucia where we board a boat for a two hour cruise on the lake in this proclaimed World Heritage Site. Here you are guaranteed to see hippos, and a very good chance of seeing crocodiles and a vast array of bird-life. The iSimangaliso Wetland Park has both one of the largest estuary systems in Africa and the continent's southernmost coral reefs. In granting it World Heritage status in 1999, the World Heritage Committee noted the park's "exceptional biodiversity, including some 521 bird species". Situated on the central Zululand coast of KwaZulu-Natal, the park is made up of 13 adjoining protected areas with a total size of 234 566 hectares. Its remarkable biodiversity is a result of the park's location between subtropical and tropical Africa, as well as its coastal setting. The iSimangaliso Wetland Park has its origins in the St Lucia Game Reserve, declared in 1895 and made up of the large lake and its islands. St Lucia Park was proclaimed in 1939, containing land around the estuary and a strip of about one kilometre around most of the lake shore. After our two-hour cruise and lunch we make our way back to Durban, arriving late afternoon where we drop you off at your overnight accommodation or at the King Shaka International Airport in time for your flight.